This traditional style dream snare has a pentagram woven into its fine web and supports a sacred crescent moon, deflecting evil influences, misfortune and physical harm, averting the evil eye from wanton malefactors. 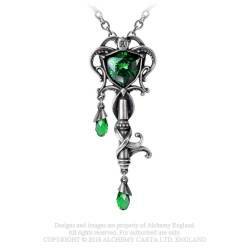 Compliment any outfit and Catch your dreams or nightmares with this stunning pendant. A 45mm diameter pewter ring, framing a etched stainless steel crescent moon and pentagram 'cobweb'. From below it hang three pewter feathers, one set with a white Swarovski crystal, and a small crescent moon. On a long, 32", (80cm) continuous trace chain. With a pentagram woven into its web, the dream snare deflects evil influences and misfortune.